Finish by midnight on Sunday if your whole class is doing parallelograms. If it is even, then it is divisible by 2. If the digits add to 3, 6, or 9, then it is divisible by 3. If it ends with a 0 or 5, then it is divisible by 5. Remember, 1 is NOT a prime. Just visit the Is this a prime? website and see how many numbers you can identify as primes or non-primes. There will be a prize for the top Y7 student, and 100 bonus badge points for everyone in the top 10. If you can score more than 10, then email us at prizes@parallel.org.uk – just send us a screengrab showing your score by midnight on December 11th, and in the subject line write Y7 and the number of numbers identified. For example, if you scored 13, then your subject line should read “Y7 13”. 2.1. Square A has sides 24 cm in length, but Square B has a perimeter of 1 m. Which has a larger area? If square B has a perimeter of 1 m, then it has sides of length 25 cm, so it will have a larger area. 2.2. Which triangle has the larger area? Triangle A has sides 5, 5, 6, but Triangle B has sides 5, 5, 8. Split both triangles into two right-angle triangles and use Pythagoras’ Theorem to work out the height of each right-angle triangle. You would need to draw the triangles and see that they can be split into two right-angle triangles. Then use the Pythagorean theorem to work out the height of each right-angle triangle. Then you will see both of the big original triangles is built from two 3-4-5 triangles, but they are arrange differently. So they have the same area. 2.3. What is the area of a triangle with sides 23 cm, 13 cm and 10cm? The quick way to do this is to notice that 23 = 13 + 10, so the two short sides add up to the length of the long side... so we have a flat triangle with no area. 3.1 This sculpture of a train coming out of a tunnel is by the artist Cindy Chinn. How long is the steam engine, roughly? What is the sculpture made from? Why are the tracks and the train black? Why is everything else made of wood? 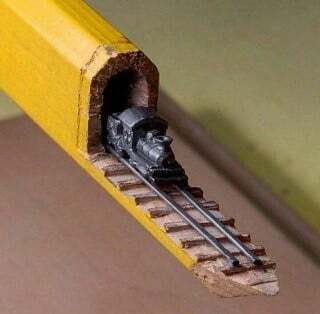 It’s carved from a pencil, so the steam engine is about 1 cm long.